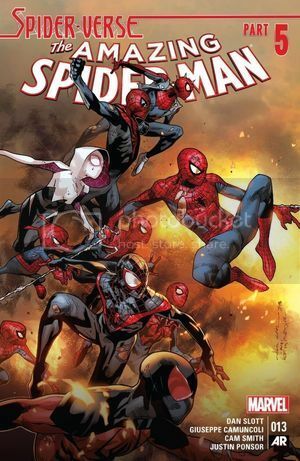 Dan Slott and friends are really taking advantage of the essentially unlimited opportunities to create alternate versions of Spider-Man that are a wink to niche fans, references to past storylines, linchpins to propel the intricate weaving-together disparate elements of Spider-Man mythology and continuity (slightly mixed metaphors there), and opportunities to make profound juxtapositions. I love to see a form of entertainment that accepts what it is and attempts to be the best version of that thing that it can be. And when it comes to an all-reality spanning adventure that affects every alternate version of Spider-Man imaginable, this is it. This is one of those stories that is so satisfying, you hate to see it end as much as you want to see where it’s going. But it looks like next issue is the finale, so there’s that. 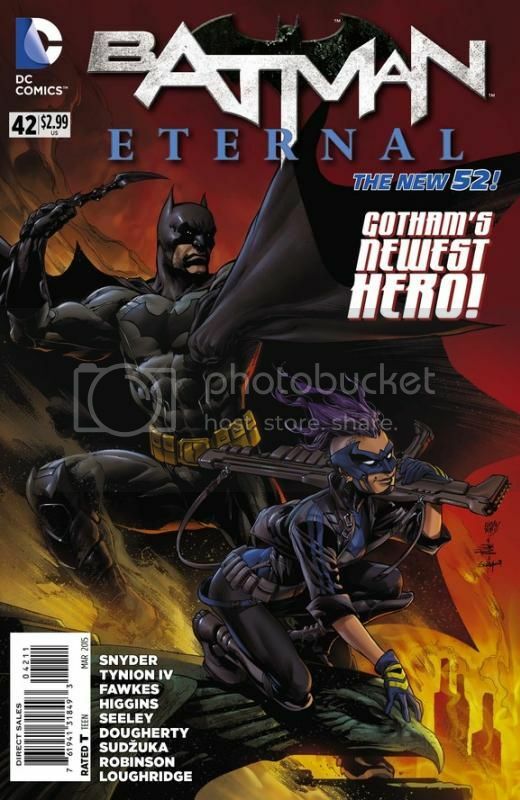 Speaking of stories that are nearing the end of their runs, that leads me to Batman Eternal #42 of 52. I think there are 52 anyway. When it comes to weekly series, I haven’t enjoyed one since the original 52. Countdown was terrible (though I highly recommend reading Doom DeLuise’s weekly recaps). Trinity was bad enough that I think Fin Fang Doom quit reading comics in the middle of it. I started reading World’s End but it was awful. But with Scott Snyder behind Batman Eternal, I’m not surprised it’s pretty good. There are definitely ups and downs throughout, and with a schedule like this the art is bound to be inconsistent (though there have been some pretty excellent runs along the way), but overall it’s definitely a thumbs up. This week’s was an “Eh” for me. Sometimes things are broadcast so far in advance that when they finally happen, you’ve already anticipated it enough that the punch doesn’t land. Sometimes it’s ok to know where the story is headed when the fun is how you’re going to get there; in this case, Harper coming to save the day and earning the respect of Red Robin had to happen eventually. It wasn’t done poorly, but I just felt like it was one of the items on the list that we knew we’d be checking off in this run toward the end of this story. I also just groan at the over-the-top attempt to depict her as an edgy, counter-cultural teen with all of her piercings. Her septum piercing just looks like snot dripping out of both nostrils. But whatever, Red Robin digs her and she digs Red Robin. Speaking of liking Red Robin, whose burgers I enjoy, that leads me to Guardians of the Galaxy #23, on which the cover appears to be flame-broiled Rocket Raccoon, whom I probably would not eat. 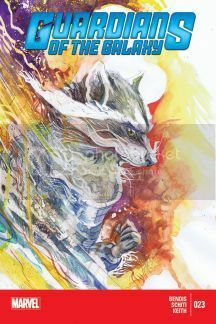 One need look no further than the archives of this blog to see how beloved the Abnett-Lanning Guardians of the Galaxy was. And the new series is ok. But man, it’s issues like this that just make it painfully obvious — and uncomfortably obvious — that famed comic book writer Brian Michael Bendis is engaged in a futile struggle to write these comic book characters as well as James Gunn was able to in a movie. And it’s clear that he’s trying. And it’s clear that he’s failing. In Bendis’ Guardians, Peter Quill is essentially a seductive Steve Urkel, constantly creating messes and responding with some variation of “Did I do that?” as Carl Winslow, played here by the rest of the Guardians of the Galaxy, shout “Peter!” Also this month we get a new origin for the Venom symbiote, since Venom is why approximately zero people read Guardians of the Galaxy. Speaking of things nobody reads, that leads me to All-New X-Men #35 in which the All-New X-Men are hanging out with the Ultimate X-Men, whose popularity has led their series to be canceled like three times and do not currently have a book of their own. 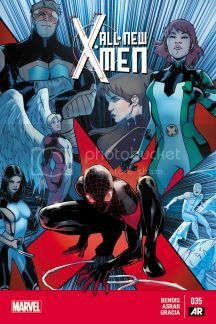 Because now you have time-displaced X-Men who are now dimension-displaced, hanging out in the godforsaken Ultimate Universe, and it’s apparently in Bendis’s contract that Iceman needs to awkwardly comment about some spandex-clad heroine being hot in every issue. He can’t write funny teams (Guardians) and he can’t write funny teens (All-New X-Men). Maybe just lay off the humor for a while, because it’s not working. That said, this series does still have an element of unpredictable fun to it. I’m just a little worried that its element of irrelevance is overtaking that. The art is always top-notch and pitch perfect for the stories, so I will not be ditching it yet. Speaking of not working, though, I hope to be back next week and not take another year-and-a-half hiatus.